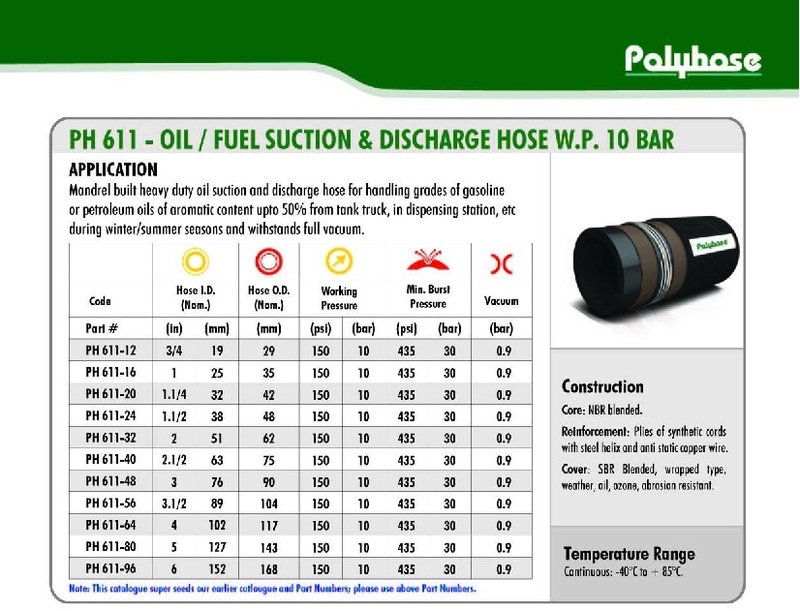 Short Description : LARGE BORE INDUSTRIAL HOSE PH611 OIL / FUEL SUCTION AND DISCHARGE HOSE W/P.10 BAR Application: Mandrel built heavy duty water suction and discharge hose for handling grades of gasoline or petroleum oils of aromatic content upto 50% from tank truck, in dispensing station, etc., during winter/summer seasons and withstands full vacuum. Construction: Core: NBR blended.. Reinforcement: Plies of synthetic cords with steel helix and anti static copper wire. Cover: SBR blended, wrapped type, weather, oil, ozone, abrasion resistant. Temperature Range: Continuous: -40?C to +85?C. Application: Mandrel built heavy duty water suction and discharge hose for handling grades of gasoline or petroleum oils of aromatic content upto 50% from tank truck, in dispensing station, etc., during winter/summer seasons and withstands full vacuum. Reinforcement: Plies of synthetic cords with steel helix and anti static copper wire. Cover: SBR blended, wrapped type, weather, oil, ozone, abrasion resistant. Temperature Range: Continuous: -40°C to +85°C.